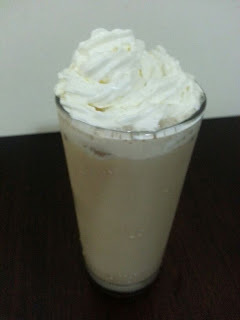 I make frappuccino for my husband very often and he thoroughly enjoys it. I haven't tried it as I do not drink beverages. It is very easy to make and I am sure it tastes good. 1. Add the instant coffee to hot water and mix well. 2. Add 1/4 cup milk to this and mix well. 3. Place in the freezer for an hour. 4. Blend together this chilled coffee, remaining 3/4 cup milk, sugar and crushed ice till the ice has completely crushed and the drink is smooth. 5. To serve pour in a glass and add whipped cream on top. 1. Add 1.5 tablespoons chocolate syrup while blending to make mocha frappuccino or 1.5 tablespoons caramel syrup to make caramel frappuccino.